The Old Holyhead Coach Road. Our second North Wales regional ramble and it seemed that I had made the wrong choice of date again, according to BBC Weather - "Continuous rain, all day." Our party was a small one, understandable perhaps at this time of year in an area as rugged as this! Andrew, Ron & Lynda, Steve & Buddig with carers Hywel and Anne, plus our trusty local helpers Clive and Malcolm, a former Mountain Guide colleague of mine for many years, a very useful man to have near should anyone fall into a crevasse. We set off just after 10.00am in an optimistic mood, as the rain was lighter than expected. We made steady progress on the old coach road, surfaced (now!) at the start, but were soon on the original uneven stony track, constructed in 1799, under Lord Penrhyn's orders. This good surface brought us, too soon, onto a softer/soggier one, where Steve's power-chair briefly needed a strong shoulder for assistance. We continued in this fashion, along the wet 'n wild valley, no cover of any great substance, except for the occasional stand of trees which provided a poor, brief respite, among the great shadowy mountains on either side of us. As we neared a popular camp-site (Gwern Gof Isaf), we stopped for a drink/bite to eat under some friendly firs for a few minutes, in sight of (briefly!) "Adam & Eve" on Tryfan's 3,010ft.summit.Ron had himself done the 'historic' stride between them, in a previous life. A little further on we came to the ford, quite impressive after the persistent steady rain. We on Trampers came through it easily, but Hywel brought Steve over the bridge, due to the Power-chair's potentially vulnerable electrics. On we went, passing Gwern Gof Uchaf, the other popular camp-site in this valley. The barn where I used to stay, on early climbing trips is still there! Another short stretch of rougher, more technical track, took us up to the main A5 road, today's final destination, though not before Ron had a losing argument with a tree on his National Park loan scooter. I wonder if he'll be barred, in future, from the Park? The trip back had no great upsets, but Hywel did get a very pleased Steve through the ford, Andrew found the time to take 52 photos, with Clive's help, and everybody was still smiling. Oh! Ron didn't get an Asbo, Alan Parry who had kindly delivered it on-site for Ron was completely un-phased and serene, as per normal, and, bonus, nobody fell in a crevasse. Many thanks to our wonderful supporters, Clive, Malc, Lynda, Anne, Hywel, and 'infamous' AP. We couldn't have done it without them! What a Team !! Thanks too are due to the "Weather Gods", who, though not actually 'smiling on us', did at least 'look the other way' for once. Terry 7th.November. Tuesday 22nd October. 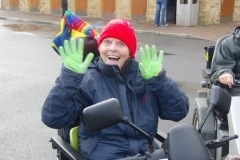 6 miles Cat 2... Val says:..... WILVERLEY WANDER Our last ramble in 2013. 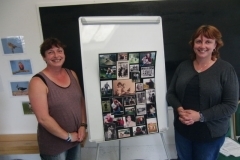 We were very pleased to welcome a new member Sarah - and her lovely dog, Harry. Sarah was accompanied by her Mum, Rosemary. The forecast was dismal, in fact so bad we had 3 cancellations, but most turned up in spite of it appearing to be a day of constant and heavy rain. We started off in rain, but as we had the shelter of the trees it wasn’t as bad as we had feared and there was an optimistic feeling in the air – even more so when suddenly a small patch of blue appeared and like magic the rest of the day was beautiful! How wrong can the Met forecast be! Wilverley Inclosure is one of the nicest Inclosures in the New Forest with an extremely varied planting of trees of all species, pine, oaks, beech, birch, chestnut, etc. and it makes for a very lovely serene feel. 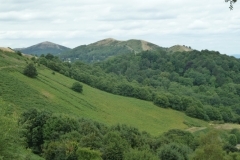 It is a 2 ½ mile ramble with some fairly steep hills and long slopes. Unfortunately, this did present us with some difficulties as will become apparent later. This is the season for fungi and there were many to see, but the best was the red “fairy” toadstool group that we saw by the side of the path, see photos. This was a figure of 8 ramble so we were able to eat lunch back at the car park where there is an enclosed picnic area to keep visitors safe from the many ponies that just love to scrounge a bite to eat. There was a little of herd of Shetland ponies there this time as well. In spite of my best endeavours we had to opt to go down a New Forest road to the start of the afternoon ramble, although a “B” road it is relatively busy and here is where the skills of road marshalling came into being. Jim and the other walkers and volunteers donned their high viz jackets and expertly guided us to Wooton Coppice for the next part of the ramble. A completely different inclosure with much smaller berry bearing trees such as Viburnum, Sloe bushes, wild rose - that type of thing for the birds to feed on during the winter, but also interspersed with larger trees here and there. 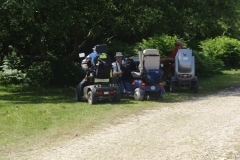 Here is where we started experiencing problems, we had two boot scooters along as I thought the tracks would be suitable. However, near the end of the coppice we had a breakdown! This was because of the many hills and slopes and the poor little scooter had run out of breath. After an initial tow it was obvious that we would have to use the escape trailer and DR sprang into action to save the day – yet again! We stopped at Wootton Bridge where there is a fairly fast flowing ford and 6 or 7 of our members had great fun going across it several times, here the scooter was loaded onto the trailer and the intrepid rambler involved shared a seat on a TGA Supersport with Sue, and we wended our way back along the said nasty bit of road back to the car park and safety. Leading rambles along roads is obviously best avoided, but due to the excellent road Marshalls and how they spaced us into groups, and also not forgetting the consideration of the motorists, we were grateful to them for getting us back safely. We did have one stroppy motorist on a bridge but we were supported by all the other motorists who had stopped to let us over, so one person being awkward is quite a good result I think! All this is in the photos to see, and I think is a great compliment to DR for how members are supported and helped when this sort of thing happens. We were pleased that Rosie and John joined us for the afternoon, after being put off by the rain earlier, it was nice to see them. Also, great to see Jim and Dorothy on this last ramble. Well, I think we will all agree it has been another terrific year of rambling, and I know there is another great year ahead in 2014 so I’m sure I speak for all the Committee in saying we are looking forward to seeing as many of you as possible next year to enjoy these routes – in the meantime, good health to everyone and have a happy Christmas and good New Year and many thanks for all those who have attended the rambles during 2013. Monday 21st October. 5 miles. Cat 2. Val says: PENNINGTON MARSHES. It was fortunate that on the Hurst Spit ramble the Leader of this ramble, Di, noticed that the sea-gate was closed and that this would affect the route we were to take for Pennington Marshes the next day, after a lot of phoning etc. 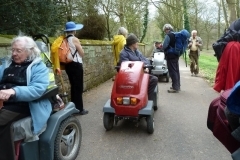 to the Environment Agency it was decided that we had to go to a different car park to start the ramble. 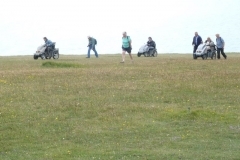 This was efficiently dealt with and everyone had directions given to them to go up the coast a little to Keyhaven and the car park there. Although while we were in the car park we had some rain this stopped and again, in spite of the forecast, the weather was very kind to us and the whole day was dry, and how pleased we were! This is a popular and very scenic ramble overlooking the Solent once more, with the Isle of Wight in view all the time and there is always plenty of activity on this stretch of water. Hampshire County Council purchased this beautiful area of coastline between 1973 and 2006 to protect its unique historical and and wildlife heritage. The reserve covers nearly 200 Ha (500 acres) between the mouth of the Lymington River and the village of Keyhaven. 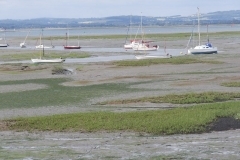 The adjacent mudflats and salt marshes outside the seawall are leased by Hampshire and Isle of Wight Wildlife Trust and form their Keyhaven and Pennington Marshes Reserve. Together these two reserves ensure the protection of an extensive area of coastal habitat. Both reserves lie within the New Forest National Park, recognising their importance for both wildlife and people. 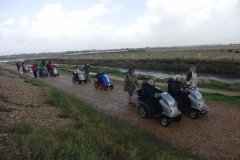 We had good views of the marshes and their wildlife from the Solent Way which runs the length of the reserve. Because of the time of year there were many sea birds that were either sheltering or on their way to their winter habitat. A little group of Knot were feeding on the sea weed and gave a nice little show for us as we passed them. On the marshes were Egrets, all variety of ducks and geese and other waders etc. A Birdwatchers paradise! Cows also graze this area, and this time there were also some horses and ponies which took fright when they saw us and went cantering off through the marshes, which all added to the general atmosphere of the area. We had lunch on the green by The Chequers pub, some of us went in for something warm but as the weather was holding most of us stayed on the green with our packed lunches. On the trip back along the sea wall it was so very windy it made walking quite difficult for our walkers and volunteers, but the outlook and scenery was so impressive that everybody enjoyed this last leg of the ramble and we were very thankful that it wasn’t raining as that would have been really uncomfortable for us all. The photos give a very good indication of the light, and the wonderful views and wildlife we were able to appreciate which all go to make up a really enjoyable and memorable day. Sunday 20th October. 5 miles. Cat 3 Hurst Spit juts 1½ miles into the Solent towards the Isle of Wight. Free visit to Henry VIII’s Hurst Castle thanks to English Heritage and Hurst Castle Services. Val says: After a very successful and enjoyable season of rambles the dates of the last 3 finally arrived, and on the morning of Hurst Castle the forecast looked grim indeed. At the car park overlooking the Solent and the Isle of Wight the sea was very rough with white horses and spray crashing on the beach, and on us, as we started the ramble – luckily we were able to divert from the wettest bit of path and stayed dry a bit longer! The weather surprised us and it was actually one of those autumn days with a very brisk wind, stormy clouds, sunshine and the really spectacular coastal views of the Solent and all the activity that goes on there with the Isle of Wight in the distance. Lovely in the summer when it’s hot but equally worth being there to see the different aspect you get with the onset of the change of seasons. As in the photos, we were treated to a very skilful display by the kite surfers while we had our coffee break before braving the shingle spit that leads to Hurst Castle. We were all very impressed with the skill involved and some of the jumps and leaps that the young surfers did were very daring. They seem to be able to stop almost on a sixpence, and with the various posts and rocks in the lagoon they were surfing in they really had to at times. We then progressed onto the Spit and it was well worth doing, you have a 3 dimensional view – Hurst Castle ahead, looking very ominous and historic, with the Solent and the coast of Christchurch, Bournemouth and Poole on our right, ahead and to the left was part of the Isle of Wight with The Needles in view and also the coast leading to Lymington and on up to Hamble. It was also very windy! We all managed the shingle very well, there were a few softer and deeper parts but they didn’t cause a problem. We arrived at the Castle in time for our lunch break and within the Castle is a museum with very interesting artefacts and information. It was built by Henry VIII and it was one of the most advanced artillery fortresses in the England. 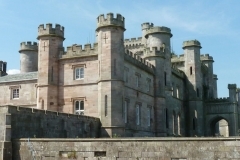 The castle was used as a prison for eminent 17th century captives, and later strengthened during the 19th and 20th centuries. It commands the narrow entrance to the Solent with glimpses of the Isle of Wight on clear days. It is a rather grim looking fortress but well worth the trip along the shingle spit to visit. Some of us ventured up onto the battlements to see the view, and the wind was so strong it was difficult to stand up at times, but worth the effort to climb the 30 or so steps to see the view all around the Castle. There is a ferry operating and this is pictured in the photos. Sadly, at this point the Met Office forecast came true and the rain started, however, as we started along the Spit again, fearing we were all going to get well and truly soaked, the sun came out again at times in between the stormy clouds and we did get back to the car park fairly dry. Some of the party were not so lucky and caught a particularly fierce downpour as they were a bit behind the rest of us, but we were all togged up anyway so as we are intrepid DR’s we throw caution to the wind and rain and carry on! It was a super ramble and well worth doing. An achievement to have got along the Spit, mostly Trampers but at least one TGA Supersport, and none of us had any trouble. Terrific! STONEHENGE & ENGLISH HERITAGE FILMING AFTERNOON, Stonehenge, Wiltshire – 30th September 2013. 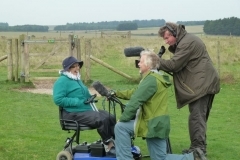 The Southern Regional Group were recently requested by English Heritage if we would be willing to take part in a short film clip to go on their website to demonstrate that disabled people COULD still access this wonderful site and enjoy the magical experience that is Stonehenge. 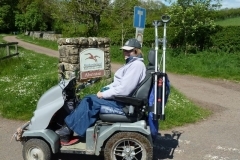 This will also be linked to many other websites and could be a wonderful source for people to get to know about Disabled Ramblers and what we do. 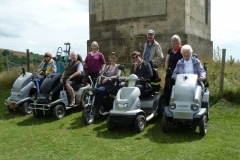 Accordingly, 8 scooterists and 4 walkers, accompanied by the English Heritage representative, 2 film makers and our valued NT guide met at the car park at Stonehenge. Weather was a bit uncertain, but in the event the rain held off and we had an overcast but dry afternoon, but whatever the weather - in such an historic place as Stonehenge there is such an atmosphere anyway the weather almost doesn’t matter. The history of Stonehenge is long and complex but briefly, it was built originally as a temple, and was a place of ceremony, burial and celebration and was added to and improved over the centuries. We set off through the gates towards the barrows that look down on Stonehenge and are ancient burial mounds, our task was to see how difficult the gateways and terrain was and how it could be improved. The first gateway involved a step – which was interesting especially for the smaller scooters. We had a huge selection of scooters from Trampers, 3 and 4 wheelers, TGA Supersport and Vita, Shoprider types, and boot scooter. Everyone, even the film crew mucked in to help, it was all very relaxed, friendly and very interesting. Luckily, there was a mown pathway up to the Barrows so there was no problem getting up the hill that led to that area, even for the small boot scooter. Very stoical rider, of course! Naturally, once there some of the braver ones tried to get up the first mound, but it was too steep, however, the second mound was better and most got up there and could view the surrounding landscape from the top. The camera crew had a variety of equipment and had to set it up ready, so after a little wait they would signal for us to move forward and filming would start. One of the pieces was an extremely tall mast so that the camera looked down on us, and these two poor chaps had to run ahead of us carrying this heavy equipment, no moaning though. 3 of us were interviewed and asked to give our views on the access issues. After some more filming around the Barrows and around the Stonehenge site itself, we were treated to a cup of tea and a cake, courtesy of English Heritage. Still the weather held, and had that autumnal silvery, light that added to the impressive feel of the site. 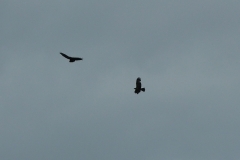 Many birds, rooks, starlings, pigeons , were wheeling all around the Stones and perching on them, and a kestrel was hovering nearby. It all looked magical! The surrounding landscape is wonderful, it is all part of Salisbury Plain. We were then lucky enough to go into the Stones and go round the circuit that surrounds them, we couldn’t go amongst the Stones themselves, but it was quite an experience just to be as close as we were. We hope to incorporate a late night viewing of the Stones on the ramble we hope to include in the programme next July, and at that time, if we are lucky enough to be able to book a slot, we can actually go in amongst them. This usually takes place at 8pm when all the visitors and tourists have gone home. That marked the end of a most enjoyable and fascinating afternoon, which went like clockwork and we all had a really great time. 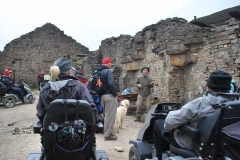 We had much appreciated hospitality from English Heritage, and our NT guide and Julian and Stuart - the camera and filming unit, and our thanks goes to them for giving Disabled Ramblers this chance to demonstrate what we do and how much we enjoy it. This was an opportunity too good to miss, and was well worth the effort. Thanks to all our members who were able to come, and commiserations to those who couldn’t for a variety of reasons. 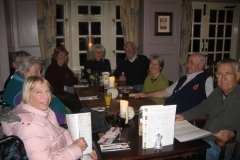 We then found a lovely village pub nearby and had a meal before we wended our way home. Val. HOCKLEY VIADUCT RAMBLE, WINCHESTER, HANTS. 19 September 2013. This was a much looked forward to ramble, led by Eric Reed and his wife Liz on our behalf. 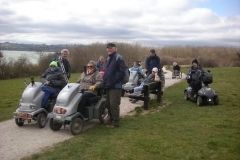 We had a good attendance of 10 scooters and 3 walkers. The day started off well weatherwise, dry but a bit overcast. From the Winchester Park and Ride we progressed down the main road to a little muddy footpath which was a bit unexpected! Caught a few of us out, but we managed very well – then off up an old flint byway which overlooked the area of Compton, we were up high above the landscape and St Catherine’s Hill, a local beauty spot well known in the Winchester area, was also visible. We went through a butterfly meadow, which on the initial reccy in July was alive with wild flowers and many butterfly species, then through a narrow footpath through a little wood and onto a large rolling meadow which had swifts diving all over the cut grass hunting for the insects, grand views here of the area, and we stopped for our coffee break here to appreciate the views over the landscape surrounding Winchester. 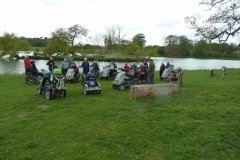 We had a guest for this ramble, Tony, who unfortunately took a tumble from his scooter – however, he was unhurt and was very pleased to think of being able to tell his grandchildren and how it would amuse them, he took it in very good part, his only regret was that we didn’t catch it on camera! We then carried on until after our lunch stop which overlooked an area known as Olivers Battery and also overlooked part of Winchester with the Cathedral right in the middle of the view, and views of the prison also! From here we could see the rain closing in towards us, and this also completely obliterated the view, so on with the waterproofs. We went into suburbia albeit through quiet roads, a very varied ramble this, until we reached the old part of Winchester known as St Cross, with Alms houses and ancient cottages and buildings. Then on into the city with the River Itchen flowing along on our left, it is a chalk stream and is crystal clear. Very picturesque along this part of the ramble, and luckily we found a super tea room where they allowed us to go in with about 4 or 5 of our scooters, for a welcome cup of tea and cake, by now the rain was coming down thick and fast but as waterproofs had been donned we were quite happy, but a bit cold. We all warmed up nicely, and proceeded along National Cycle Way 23 to the viaduct, a trip of approx a mile and a half. This, again, was through woodland with the river alongside, but now on our right. 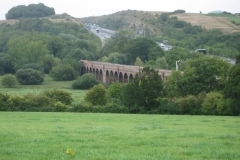 The viaduct has 33 spans, is 2014 feet long, and was opened on 1 January 1891 and was the rail link from Winchester to Shawford Junction on the LSWR main line,it has been restored as part of the national cycleway and spans the water meadows, it is very rural and beautiful outlook, but among this is the M3 motorway roaring along through the cutting in the hills. A complete contrast with the viaduct, water meadows and traffic but all mingling in to make a very interesting sight. Finally, over a very busy road – admirably supervised by the walking team and then back to the Park and Ride ready to load up and go home. A very interesting and varied ramble, enjoyed by us all. Special thanks to Eric and Liz, and also to all who attended and made it such a good day. Val. Friday 13th September. 8 miles Cat 3 Our last day, we have had a super week and this particular ramble is across a sandy beach so is completely different from the other routes we have been on so far. 20 scooters attended, so another good turnout. 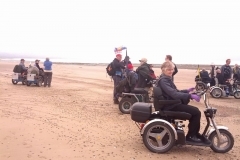 The weather was good to start which is always a bonus, we went onto the beach at Newborough Forest – a huge expanse of sandy bay, very beautiful with sand dunes. Our Warden who accompanied us explained that many years ago, in the year dot, it would have been just sand for miles inland, but over the decades the dunes have become host to marram grass and plants and the forest was planted behind the beach. It is exceptionally scenic, great fun was had on the hard sand while the tide was out, we then went onto the island of Ynys Llanddwyn, where there are many legends and our Warden told us about a princess from the mainland who was going to have to marry against her wishes and she fled to the island and as long as she remained there she was safe, there are other aspects to this tale – but, sorry, due to the age problem I can’t remember them! Anyway, it was very interesting at the time. There was a lovely old ruined church too with similar tales attached, and a row of pilot’s cottages overlooking the sea, where the Pilot’s used to be rowed out to guide the ships through the safe channel which is still marked by buoys. The cottages had an exhibition on show and this winter they are going to be refurbished to their original state, they were tiny and very quaint. Years ago an old lady, called Nell, used to cook for the pilots in the tiny cottage at the end of the row. She used her little donkey to bring supplies to the cottage; it must have been a very difficult life. A very beautiful spot with lots of sea birds around, cormorants, shags, gannets, and many others – plus a pod of dolphins are regularly seen in the sea around the island. From there we did a loop round the island and retraced some of our steps into the forest, by now it was raining, so on with the waterproofs once more, the forest was very lovely with many unusual species of flowers among them a type of Wintergreen, small white flowers, which is nationally rare and only found in N Wales, plus Dewberries – a berry related to blackberries but a lovely bright blue and very tasty. We had our lunch here, trying to shelter under the trees, mainly Corsican Pine, it was here the Warden explained about the disease affecting the Pines. This was a completely different ramble and thoroughly enjoyed by all, at the end of the day in the car park it was lovely to be able to get a cup of hot tea from the little kiosk, warmed us all up, must be mad to be sitting in the rain drinking tea!! (and a cream slice). Sad to say goodbye to everyone after such a super week, we all hope we can go to Wales next year; I shall definitely be on the list. Val. Thursday 12th September. 7 miles Cat 2. 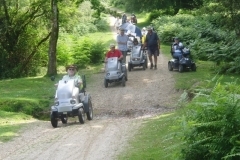 The weather was really bright and sparkling when 24 scooterists turned up at Aber Falls car park. We set off up a steep but good track with the Menai Straits behind us, to our left was the site of the Cat 4 ramble to the summit of Drum and from where we were it looked unbelievably steep! The surrounding hillsides were covered in low lying yellow gorse bushes and heather, blackberries were abundant – ideal for snacking as we went along. The whole morning trek was steadily uphill and really told on some of the scooters, we had to have frequent stops for the motors to cool. One trick someone told us about is that if the motor is accessible clumps of wet grass helps to cool it down, and on this particular day we did have barbecued grass! It does work, and with a lot of effort the scooter eventually reached the lunch stop. Lunch was on a plateau with a panoramic view over the surrounding mountains and seascape, weather at this point still sunny and fresh, so the views could be fully appreciated. After lunch we retraced our steps, one puzzling thing was swathes of trees, many hundreds, looking very ghostly and bleached white, obviously dead, rather like a petrified forest with no leaves or any foliage, the only possible cause seems to be perhaps due to a disease, and on one of the other rambles the Warden did say that Corsican Pine is susceptible to a disease so that may have been the culprit. It did look very eerie, but picturesque at the same time. The views going back were terrific, you get a completely different aspect when retracing your steps, I always enjoy it. Before reaching the car park we branched off to the left to go uphill for approximately a mile to the Aber Falls. Here Dora ran out of breath again, so I waited at the bottom for the others to return – by now it was steadily raining, waterproofs to the rescue. 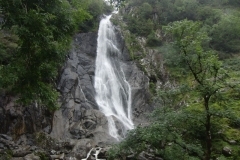 Apparently, viewing the Falls needed care, but as you can see from the photos on the web, they are well worth viewing. The approach through Alder woodland was unusual, and only a small group at a time could view the Falls as it was quite a restricting pathway leading up to them. By now it was raining quite hard, but it didn’t spoil the day and we were all looking forward to the last ramble of the wonderful week we have had in Snowdonia. Val. Tuesday 10th September. 7 miles Cat 2. 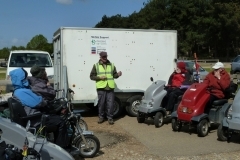 A few more assorted scooters on this ramble, 25 in all but among the Trampers and Supersports were 2 powerchairs and some Mini Crossers and others. We started out from the car park at Penrhyn Castle through the estate woods with the river to our right, lovely woods and a great contrast in the terrain – this time very smooth tarmac, flat paths! Seemed strange after the previous 3 rambles, but a nice rest. We stopped for coffee at Porth Penrhyn, a little harbour which leads out to the Menai straits, opposite us across the water was Bangor with the Pier in sight. We then proceeded through the ancient woods with the River Afon Cegin to our right where otters and kingfishers are regularly seen, I was lucky enough to spot a kingfisher, albeit from a distance, but unmistakeable because of the bright turquoise flash – it was flying low across the surface of the river and we were looking down on it- the Ranger was pleased that some of us had seen one and said that particular spot was a popular fishing place for them. We then came to the Glasinfryn Viaduct built way back to transport the slate from the mines. Great pillars and arches going across the woodland, by contrast the other side of this beauty spot is the 2nd largest council estate in Wales, but we couldn’t see it from where we were. A wonderful spot to live and the Ranger said a lot of work has gone into helping the community to appreciate the surroundings with good results. Lunch was held in a meadow of clover and rye grass, plenty of wasps to keep us amused, but a lovely spot to be able to have our stop, better than McDonald’s any day!! After lunch we returned the same way back to the Castle where we explored the gardens, which were very interesting with narrow windy paths among lush foliage, before going into the Tearooms for a welcome cup of tea and cakes. 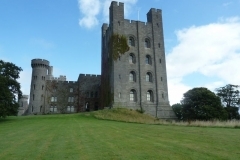 The castle is quite an imposing grey building with lovely parkland and woods surrounding it. This was a nice easy ramble to follow 3 quite challenging rambles during the previous few days, it was very enjoyable, well organised with a good turnout and really good fun. Val. Monday 9th September. 9 miles Cat 4. This Cat 4 ramble was the “special” of the Tour. 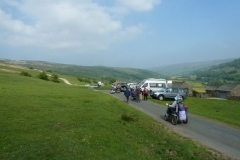 It was excellently co-ordinated in that some of us had to park at the lower car park, namely the larger vehicles, motor homes etc., those who were able had to go up a 1 in 5 winding single track road for a good three quarters of a mile to the upper car park, from where the ramble started. The whole start was managed by those leading communicating by radio to ensure the safety of us all going up to the upper car park as to meet another vehicle would have been alarming! We all got there safely, and the remaining members were then ferried up by the amazing Rangers who were coming with us, complete with support vehicle and trailer, which was used later in the day!!! 8 Trampers and 4 Supersports plus a good number of walkers, volunteers and at least 3 Rangers started the ramble up a very steep rocky track with mountains all around, the gorse and heather were in flower and made a spectacular sight all up the hillsides, as well as late ground covering species. Some of us were lucky enough to spot a hare bounding up the hillside, and on the lower level there were cattle, sheep and hardy little ponies grazing. They looked at us as if we were slightly mad. We were warned to keep a close eye on the battery percentage and to rest if we smelt the motor getting hot. It was very steep all the way, we had frequent stops which was great because we could appreciate the scenery fully. We could see all across the Menai Straits with Puffin Island in clear view and the Great Orme headland in the distance. All the scooters coped very well with the care being taken, but unfortunately, my Supersport gave a big sigh and refused to go any further at one point, luckily near the lunch stop and I had the honour of being able to take advantage of the support vehicle and was taken on up to the lunch stop, a few hundred yards ahead. Poor old Dora. 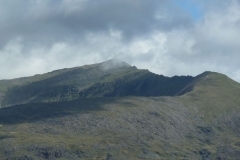 A Tramper had also had trouble, quite a few did – but they recovered after a good rest, so myself and Vic had an hour or so in the pick-up watching the mist sweeping over the mountains, while the rest of the group proceeded to the summit. It was very spectacular, and just below us in the valley, was a reservoir and every so often the sun would shine through the mist onto the water and it sparkled like diamonds! (bit of poetic licence allowed here!). It was an ever changing picture. We watched through the binoculars as one DR member after another appeared on the horizon as they made their way back to us. 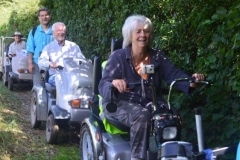 In the end 3 scooters made it to the top – Nomi, Robin and Jo, so a great achievement, photos on the web. Well done them! The trip down, again as on the Bwlch Cwm Llan 3+ ramble, was much easier and dear old Dora managed it even with the battery light flashing. It was an exhilarating day, and greatly enjoyed by us all – many, many thanks for the excellent management and co-ordination by all who arranged it and the Rangers were superb. Val. Saturday 17th August. 8 miles. Cat 3. Mike Longbottom Memorial Ramble 17th August 2013. The ramble in memory of Mike was such a pleasure to be on and was a resounding success. We all met at the Sheepdrove Eco Conference Centre in Lambourn. This is set down a very long drive amidst the beautiful rolling landscape of Lambourn, everywhere you look is spectacular and the Eco Centre was a perfect setting for our start to the day. There were 23 scooters attending and 7 walkers. Also walking with us were Mike’s two daughters, George and Claire, and family friend, John, and much to everyone’s delight Quinzy, Mike’s lovely Labrador, was also there looking just as always – raring to go and full of life. We started off the ramble with Robin leading and appropriately, as a further tribute to Mike, our backmarker for the day was Nomi – and of course, as many of us know she was delighted to be able to obtain Mike’s Three-wheel Tramper and so, in essence, Mike was with us as ever our faithful backmarker. 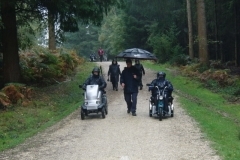 We all thought of him before we set off and of all the amazing contributions he made to Disabled Ramblers. We followed bridle paths with the wonderful scenery on either side of us, corn fields ready to be harvested and cattle, pigs, and sheep dotted about. With Autumn starting to make itself felt the foliage on the banks was showing the changing colours of the season, and was just as lovely as when first in flower. 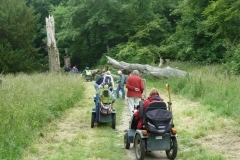 We had a few challenges on the grassy and slightly rutted paths, but we all coped very well and with the help of the volunteers and walkers all made it safely up to the famous and magical Ridgeway that snakes across the countryside. We had lunch at Segsbury Castle, a 30 acre iron-age fort some 2,700 years old and 700 ft high in the Lambourn countryside. Slight hiccup here, as the gate was supposed to be left unlocked for us, but all was well in the end after George managed to get in touch with the appropriate person who roared up in a Range Rover and unlocked the combination lock for us. 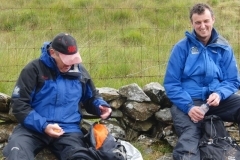 Lunch was very windy, but in true Disabled Rambler fashion we all carried on regardless – until we had a very heavy shower. 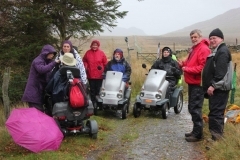 That really brought out the best in us, but we all still carried on with brollies up and waterproofs on, it really was great fun and nobody batted an eyelid. 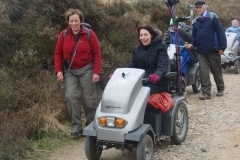 Then the return trip was just as interesting and scenic, the paths were slightly tricky but gave us the chance to practice our skills at not tipping over!!!! Great fun. When we got back to the Eco Centre George and Claire had put on a very welcome spread, hot tea and sandwiches and other tasty food and we were all able to sit down and have a chat, look at photos of Mike and dry out a bit! Stuart Kemp had arranged for a collection of donations in memory of Mike towards a plot of trees managed by the Woodland Trust. This would be in a wood selected by Mike’s family, its location would be unmarked, except by a Certificate of Dedication and a map which would be forwarded to George. 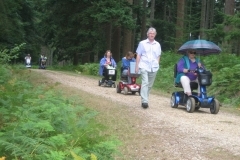 The Certificate would record Disabled Ramblers regard and appreciation for Mike, followed by the wood name and county. From donations received on the ramble at least 30 trees would be dedicated. 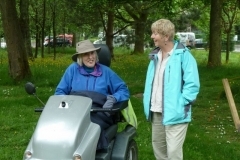 If anyone else would like to make a donation please send a cheque made out to The Woodland Trust and post to Jan Kemp, our Membership Secretary. This was a very special ramble, and we had all been looking forward to it very much. The countryside is so unique and beautiful we would like to do a lot more rambling in the area and we sincerely hope to get back there next year to remind us, once more, of Mike and how valued he was by us all. Val. Saturday 3rd August. 6 miles. Cat 3. This was a most enjoyable ramble. It was picturesque, challenging, interesting and a thoroughly good fun day. We started off from the car park into lovely old woods into an area known as Sheepleas. This covers an area of 270 acres and has been added to over the years, and it is now managed by Surrey Wildlife Trust and the Northern and middle sections were once part of the West Horsley Place estate, while the southern section was part of the Lovelace Estate. We were led by Peter, a guide for Horsley Countryside preservation Society, who do tremendous work in the maintenance of the woods and the beautiful Lovelace bridges that form an integral part of the walk that we did. As you will see they are very attractive bridges, built largely for their ornamental contribution to the woodland by the then owner. There were some difficult tracks and paths, with some deep gorges that have been made by the rain water flowing through. At one point there was a tree fallen across the path, but Peter, our guide, just happened to have a saw on him and the men got to work and sawed away until the tree was removed and we could continue. 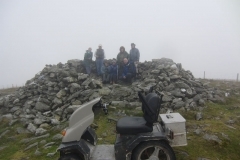 The best bit was a really steep, and I mean steep, slope – with Robin crouched at the bottom catching our faces as we made the descent down it, at first glance it looked too scary to tackle, but in our usual exemplary way we did it!! Thought Robin very brave to trust us to swerve in time to miss him I must admit. The wild flowers, and associated insects and butterflies, were beautiful, such a good time of year for them at the moment. All the time we had good rapport and at the end some of us went for a cup of tea in the local garden centre to recover! A super day, thank you Peter and Robin. Tuesday 6th August. 5 miles, Cat 3. After several days of rain, we were very pleased to have a dry sunny day for our first Hereford & Worcester Regional Ramble. A gentle start across Castlemorton Common led to our coffee break at Ruffz cafe near to Gullet Quarry. Then the fun began as we tackled the dark, steep and wet track leading up the Gullet before emerging onto more open land of the Eastnor Estate and our lunch stop at the Obelisk which commemorates members of the Sommers family whose descendants still live at the Castle. 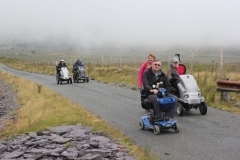 Some of us were very pleased to have the use of our new Accessible Toilet facility before descending the Gullet and on to Ruffz for icecream. Wednesday 31st July. 7 miles. Cat 2. Regional Ramble. We arrived at the dam for good views of Anglesey and Puffin Island, plus Ynys Llanddwyn, where we’ll be going in September. The sky became more threatening here with the feeling of rain in the air. 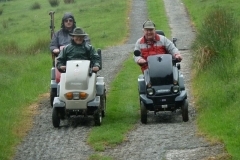 We battled on, against the driving rain and rising wind, with battery problems for Tony and Ron on his shopping trolley. The rain came down harder and harder, as Ron went slower and slower. Tony turned round and went back with Clive, while I attempted to push Ron with my scooter from behind. Nobody moaned about the weather at all. Ron’s wife, Lynda, never stopped smiling once – she was a ‘rock’ for Ron (and the rest of us) They all said at the bottom, “when can we have another go? Saturday 6th July. 7 miles. Cat 2+ Eyeworth Pond was created by the Schultze Gunpowder Company as a reservoir to be used during the manufacture of gunpowder. Ashley Hole is a famous bombing practice and testing range in the New Forest. Cat 3 if muddy. Friday 5th July. 8 miles. Cat 2 Ramble across undulating, open heathland to Hampton Ridge, where the views across the New Forest are quite stunning, continuing to Abbots Well for a scenic lunch spot. Wednesday 3rd July 5 miles Cat 2+ Ramble around a stunning area of beaches, sand dunes & harbour walks at the entrance to Chichester Harbour. Includes a stroll along a firm sandy beach. Fabulous views along the coast & across Chichester Harbour. Tuesday 2nd July. 5.5 miles Cat 2 Stanmer Park is an historic estate forming part of Brighton University and has scenic views of the Sussex downland, including Ditchling Beacon, as well as lovely woodland walks, so this is a very varied and interesting ramble through tranquil tracks onto open meadows, past a dew pond with views across the downs. Monday 1st July. 5.5 miles. Cat 3 A magnificent scenic ramble along the South Downs Way from Beachy Head, stopping at Belle Tout lighthouse, through Horseshoe Plantation to Birling Gap with views of the white cliffs leading to Seaford Head. Varied strenuous ramble, steep gradients. Not to be missed!!! Friday 14th June. Cat 1. 6.5 miles. (Was Cat 2 in fact) A ramble over mainly flat terrain with some gradients. 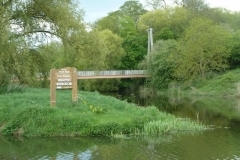 The route passes through majestic parkland, mystical woodland, along the canal and around the peaceful Rowley Lake. We had outstanding views of surrounding moorland including the Singing Ringing Tree. The ramble included a tree talk by Keith Wilson from Forest of Burnley and a talk about The Towneley family and their hall from the curator. Lunch again provided by Lancashire council at the Blind Pavillion in Queens Park. Thursday 13th June. Cat 2. 5 miles. (Was Cat 3) History of the Lancashire Witches (1612 trials), industrial archaeology. In the morning from Barley Green to the slopes above Lower Ogden Reservoir returning to Barley for our free lunch (thanks Lancashire!) then to the Aitken Wood Sculpture Trail above the Black Moss reservoirs. Tuesday 11th June. Cat 3. 5 miles. A circular bridle-way route over wild moorland, through a couple of fords past the remains of a late 18 century, Grade 2 listed, lead smelting mill. Another rough and hilly day. Monday 10th June. Cat 3. 7 miles. Using a footpath, a bridleway and a rough shooting track and ford, we go across varied scenery over open moorland with fantastic views over Swaledale. Rough & hilly. Sorry, no dogs allowed. Thursday 6th June. Cat 1. 1 mile. Guided tour of the major Roman fort of Vindolanda, renowned for its excavations and the unique tablets displayed in their museum. 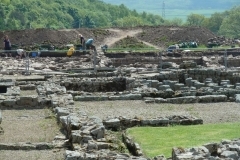 Thanks to Hugh & Jill for organising and Neal from Vindolanda for guiding us around the site. Monday 3rd June. Cat 3. 9 miles. Along an exceptionally well preserved section of Hadrian’s Wall then down to the Vallum and on to Great Chesters roman Fort. Continuing along the line of the wall to Cawfield quarry for lunch. 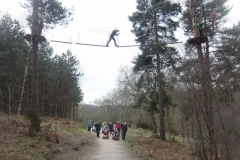 Thanks to Hugh & Jill for organising and staff from Northumberland National Park for leading. Monday 3rd June. Cat 3. 5 miles. From Wedder Leap car park, Coquetdale, into the heart of the Cheviot Hills. About 150 metres ascent. 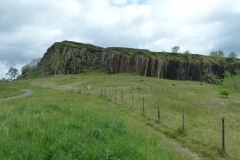 Thanks to Hugh & Jill for organising and staff from Northumberland National Park for leading. Tuesday 14th May. Cat 2. 7 miles. A ‘figure of eight’ ramble in the varied landscape of the Holkham Hall estate, mainly through open farmland and woodland on hard surfaces and grass paths. The many interesting features include a deer park, an obelisk, a beautiful lake and the majestic, 18th Century Hall itself, which is the family home of Viscount Coke. Thanks to Tony & Dorothy for organising & leading.